This superb new Professional model is like a Gibbo in Fender clothing. Dual 'buckers on a Strat should be so wrong, not in this guise, though. It has been an incredible 31 years since the American Standard range relaunched the Fender ship and laid the foundation for today's über brand, but as of 2017, the American Standards are dead. Long live the all-new American Professional series. But while the name is new, there's plenty here that's inherited from the Standard platform, such as the flattened 241mm (9.5-inch) fingerboard radius and the two-post vibratos. The Professionals - just like the Standards before them - are designed to appeal to a wide range of players with a wide range of styles. These are not for vintage obsessives. 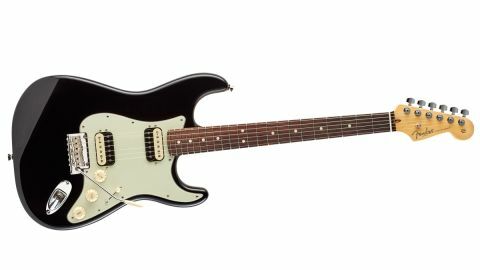 This Strat uses a pair of Tim's humbuckers, the difference being that the lower output Shawbucker 1 is placed at the neck and an 'overwound' Shawbucker 2 is added at the bridge. "The 2 is a little bit hotter, but still at the lower end of the spectrum - about 8kohm verses 7.6k - for a bit more oomph at the bridge," Tim explains. "Everything else is the same. It all works musically; it's cleaner and more subtle compared with the previous American Standard HH version. If it loses the twang, then I think it becomes a one-trick pony." There's a 500k volume control (with the treble bleed circuit), but the guitar still retains a five-position lever selector switch that offers - aside from the standard bridge, both and neck - the inside coils of both 'buckers in position 2, and the outer screw coils of both pickups in position 4. Plugging the HH in ups the rock factor with a little more kick from the bridge and a hugely characterful PAF/ bolt-on voice than found with the rest of the recently-reviewed Professional models. Drop back to a cleaner Fender-style amp, though, and there's a smoother steel-y voice that, combined with the very usable coil-split combinations, makes for a very versatile platform: it might be less Strat-specific, but it moves from steel-like jazzy and swingy blues, through crunchy classic rock gains, easily into hair metal or Foo Fighters-like gained drive. Some players will consider a dual-humbucking Strat a 'crime' - akin to adding a Floyd Rose to a Les Paul - but we don't agree It retains that percussive, brighter Fender voicing, but the dual humbuckers lose the potentially visceral cut of the single coils, while the relatively low-output voicing of the 'buckers proves highly versatile. If you're a Gibson player, you have some tonal reference (even though you only have one volume control), yet this bolt-on platform adds cut, or indeed clarity. The two 'extra' sounds over a usual three-way neck, both and bridge setup drop in very usable contrast, although they do sound a little thin compared with, for example, the partial coil-splits used by PRS on its similar concept dual-humbucker bolt-on CE 24. The big question is, are the Pros simply a rebranded Standard or an upgrade? For the everyman player, it's the latter. Sonically, too, this guitar draws on plenty of classic character: take the HH and compare it with the previous Standard, and you'll find a contrast in its clear and balanced new single coils.